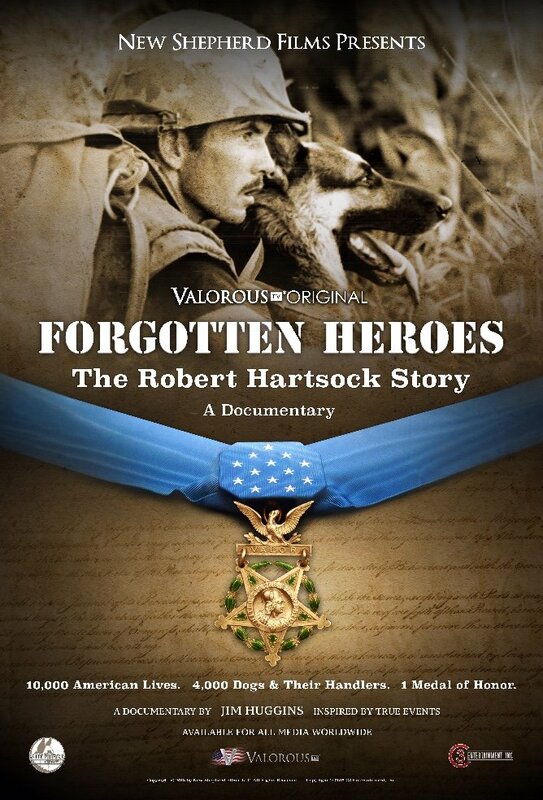 FORGOTTEN HEROES: THE ROBERT HARTSOCK STORY interweaves the story of Medal of Honor recipient Robert Hartsock with an overview of dog handlers in the Vietnam War. This inspirational and worthwhile documentary carefully explains the major issues that America faced during this generally unpopular war. Despite a few negative elements related to the world of war, this heartfelt and thoughtful movie is suitable for older children and adults. FORGOTTEN HEROES: THE ROBERT HARTSOCK STORY interweaves the story of Medal of Honor recipient Robert Hartsock with an overview of dog handlers in the Vietnam War. This inspirational and worthwhile documentary carefully explains the major issues that America faced during this generally unpopular war. Dog handlers are a relatively unknown detail about the Vietnam War, which this movie explains in a cogent and perceptive manner. FORGOTTEN HEROES includes interviews from several key men who knew Robert Hartsock over the years. Out of more than 3,600 Medal of Honor recipients, Robert Hartsock was the only dog handler to receive this prestigious award. Scout dogs became a critical part of the war in Vietnam because of their tracking ability. They saved thousands of GIs during the war. At first, some officers reacted to scout dogs with amusement or bewilderment, but eventually dog handlers and their dogs were at the forefront of a unit because the scout dog team was best able to detect many dangers, including trip wires, traps, tunnels, Viet Cong soldiers, bombs, and more. In essence, they were the walking radar of the army. A bounty was put on the heads of both the handlers and the dogs because the North Vietnamese Army realized the tactical value of the scout dog teams. Archived news footage, portions of presidential speeches and film footage from the government archives are interwoven with the personal details of Robert Hartsock’s life from his childhood through his time of service in the army as a Staff Sergeant with his dog, Duke. Key interviews include Rodger Forbes, a fellow dog handler and best friend of “Bob” as Robert was called by everyone; Larry Hughes, the 2nd Lieutenant who led the 25th Infantry Division; and, Lamar Smith, a veterinary tech who cared for the war dogs. Several other interviews add key information to round out the movie’s overall narrative. On February 23, 1969, the Dau Tieng Base Camp came under a heavy enemy rocket and mortar attack. Staff Sergeant Bob and 2nd Lieutenant Larry noticed a squad had infiltrated the camp and were heading for the tactical headquarters and the nearby prisoner compound. If the enemy took over the headquarters and the prisoner compound, then the Dau Tieng Base Camp would be lost. Bob and Larry opened fire on the enemy squad. As one of the enemy soldiers fell, he detonated the bomb. Bob Hartsock gave his life for his platoon by falling on the bomb and absorbing the charge. He still managed to crawl to a nearby ditch and provided heavy suppressive fire until Larry could get away. Duke, his dog, was not with Bob during the attack. Quite often, when a dog’s handler died, the dog would refuse to eat due to the trauma. Duke died by self-starvation soon after Bob’s death. The movie credits include archived film from the White House Medal of Honor ceremony where President Richard Nixon presented the award to Staff Sergeant Robert Hartsock’s family. There is a photo with President Richard Nixon and Dion Hartsock, the son of Robert Hartsock. The story of FORGOTTEN HEROES is told in a heartfelt and thoughtful manner. The opening credit montage is well done. There are applicable Bible verses included throughout the movie. There some subpar technical details that were subtly noticeable, such as ambient noise during an interview and a few rough transitions. There are negative minor elements such as two offensive words, war violence and positive references to alcohol and tobacco consumption that makes this movie unsuitable for young children. There’s no mention of Robert Hartsock getting married and no backstory provided about his son, Dion, or the son’s mother. FORGOTTEN HEROES: THE ROBERT HARTSOCK STORY interweaves the story of Medal of Honor recipient Robert Hartsock with an overview of dog handlers in the Vietnam War. Out of all the Medal of Honor recipients, Robert Hartsock was the only dog handler to receive this prestigious award. Archived news footage, portions of presidential speeches and film footage from government archives are interwoven with the personal details of Robert Hartsock’s life from his childhood through his time of service in the army as a Staff Sergeant with his dog, Duke. Key interviews include members of his family and service members from his platoon. The story of FORGOTTEN HEROES is told in a heartfelt and thoughtful manner. The opening credit montage was well done. There are applicable Bible verses included throughout the movie. There are some sub-par technical details that were subtly noticeable, such as ambient noise during an interview and a few rough transitions. There are minor elements in FORGOTTEN HEROES such as two offensive words, light war violence, and references to alcohol and tobacco consumption. So, MOVIEGUIDE® advises caution for younger children. Earl Benjamin, CEO, C3 Entertainment, Inc.